The Glasgow Royal Infirmary first opened in 1794 on a site where the Bishop's Castle formerly stood in the 13th century. The original hospital building held just over one hundred beds but in the 19th century several additional wings were built onto the building including a fever block and a surgical wing. It has been rebuilt twice, first in the early years of the 20th century and again in the 1980's. Today, the remaining buildings dating from before 1915 have been protected as historical listed buildings. The Glasgow Royal Infirmary boasts a modern Maternity Hospital and purpose-built Accident & Emergency facilities. It has counted several household names from the spheres of science and medicine among its staff members, including Joseph Lister, William Macewen and Professor Ian Donald, one of the pioneers of ultrasound. Today the Glasgow Royal Infirmary is a major teaching hospital with a capacity to accommodate approximately 1,000 patients. It is located in the north east of the city centre of Glasgow and for people who need to attend the hospital or visit a patient there is comprehensive information about the facilities to be found on the NHS Greater Glasgow and Clyde website - www.nhsggc.org.uk. If you are in need of a hotel near Glasgow Royal Infirmary, you will find that the 3* Sandyford Hotel is comfortable, convenient and affordable. The Sandyford is located between Glasgow City Centre and West End and we provide a full Scottish breakfast as part of our B&B accommodation package. 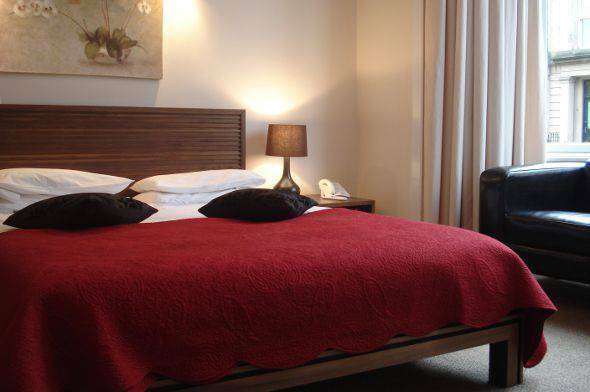 The hotel is both cheap and comfortable with 55 en suite bedrooms, Wi-fi access and 24-hour reception service. For accommodation near Glasgow Royal Infirmary, the quality of the Sandyford is second to none. Why not reserve one of our well-appointed rooms at the Sandyford Hotel by using the online booking form or by calling any member of our friendly hotel reception staff on (+44) 0141 334 0000. We will be happy to answer any queries you may have and make recommendations based on your need for hotels or bed and breakfast accommodation near Glasgow Royal Infirmary.